Neighborhoods boasting modern homes, cul-de-sacs and tree-lined streets in and around Western cities now dominate the list of the top 100 U.S. zip codes hit hardest by foreclosures, according to RealtyTrac. NEW YORK (CNNMoney) -- The housing collapse has dramatically changed the nation's foreclosure landscape. Neighborhoods boasting modern homes, cul-de-sacs and tree-lined streets in and around Western cities now dominate the list of the top 100 U.S. zip codes hit hardest by foreclosures and claim and comprise all of the top 10 spots, according to data generated for CNNMoney by RealtyTrac. In 2011, Western states claimed 82 of the 100 worst hit zip codes with 38 in California and another 28 in Nevada. That's quite a departure from when CNNMoney first looked at the top foreclosure zip codes in June 2007. Back then, the auto industry's ills had turned inner-city neighborhoods in Detroit, Cleveland and Indianapolis into foreclosure ground zero, with the three cities claiming 25 of the nation's 100 hardest hit neighborhoods. 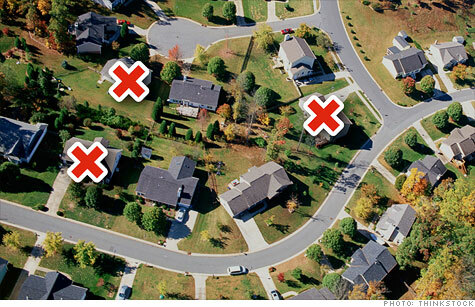 These older working-class neighborhoods were particularly blighted with vacant, repossessed homes lining the streets. In fact, they claimed 6 out of the list's top 10 spots. These days, however, many of the worst hit zip codes are communities that were built in the past decade or two in and around once-rapidly growing metro areas like Phoenix, San Bernardino, Calif. and Las Vegas, now the poster child of the foreclosure mess. In fact, Las Vegas claims all five of the top five hardest hit zip codes. The number one spot goes to a neighborhood in North Las Vegas (in zip code of 89031) that recorded 2,469 foreclosure filings last year, according to RealtyTrac. In California, the towns of Lancaster (93535), in the central part of the state, and Fontana (92336), near San Bernardino, claimed sixth and seventh place -- the highest finishers for any zip codes outside of Nevada. As far as regions go, the South claimed the second highest number of hardest hit zips with 14. Georgia claimed 12 of those neighborhoods, including one in Atlanta that took 10th place. Interestingly, not a single Northeastern zip code made RealtyTrac's top 100 list. Foreclosures can devastate housing markets. Properties repossessed by the banks, called REOs, sell for 25% to 50% less than non-foreclosures, said RealtyTrac spokesman Daren Blomquist. Yet, a single foreclosure in an otherwise foreclosure-free neighborhood will rarely impact surrounding values, he said. "In a normal, healthy housing market an REO sale is the exception and there are many other non-distressed sales that dilute the impact," he said. It's when REO sales rise to 20% or 30% of local sales, as they do in the hardest hit zip codes, that they really begin to affect prices, he said. "That's when we start to see the average discount between REO sales prices and non-foreclosure sales prices dwindle, particularly in local markets where much of the REO inventory consists of relatively new homes built in the last few years," said Blomquist. "The more REO sales dominate a given market, the more they drag down overall home prices." In a neighborhood like 32811 in Orlando, Fla., which counted 275 homes with foreclosure filings in just one month last year, home prices have plunged dramatically. One three-bedroom in the area is currently listed for just under $40,000, for example. In 2005, that same home sold for $120,900, according to real estate agent Jerome Baker. Not only that, but the listing price is "a little bit on the high end," said Baker. "We'll probably have to lower it to $29,000 to generate some interest." In Fontana, Calif.'s 92336 zip code, the average home price has been cut in half since December, 2007, according to Zillow. A four-bedroom, 2,000-square-foot house, was recently listed for $200,500, down 57% from the $465,000 it last sold for in October, 2007.